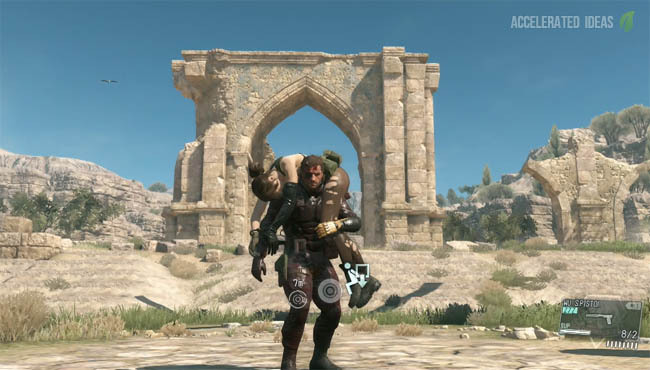 The open world of The Phantom Pain contains many species of animal; some you will encounter as you explore the map and others by complete accident. In this guide I'll show you exactly how to capture animals and their use in the game. 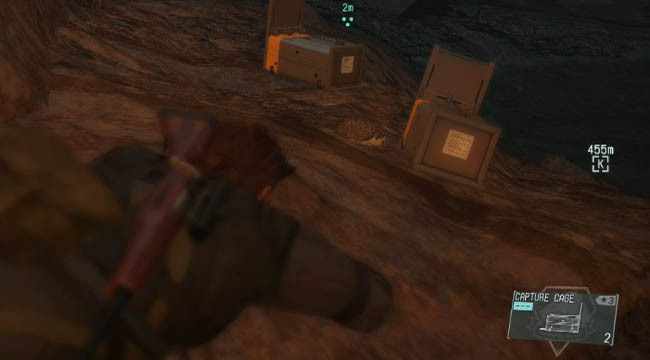 Let's start with a quick look at the types of animals in MGS 5. Animals range from very small rodents such as hedgehogs and gerbils to medium sized deer and large bears. There are birds that patrol the skies, frogs which hop about in the jungle and cute hedgehogs that sniff around for food. Each species prefers a different habitat and you'll soon learn that particular animals can be found in designated locations on the map. Using this knowledge you can set out to hunt down these animals and capture them for in game rewards. However, the higher the GMP reward for an animal, the greater its rarity and this equates to the chance that the animal will actually spawn. Players sometimes have to completely leave the map and return again in order to force the spawn. You may have seen this piece of gear under the Development section of the iDroid. It's a cage which you can deploy in the field, in the hope that you'll catch an animal. They come in a variety of sizes (grades) with the lower grades being suitable for smaller animals and the higher grades for larger animals. During one particular mission, I ventured underground and stumbled across a few small rodents in a cave. My initial thought was to deploy the little Capture Cage and wait for the rodent to enter the cage. I waited patiently in the prone position, watching through the binoculars as the little guy walked straight up to the cage and then passed right through it! The image above was a screenshot at the time. Evidently these capture cages are not dynamic and it doesn't sound like you can watch animals being captured. Instead, when I finished the mission the rewards screen did show that the animal was successfully captured. So to sum it up, capture cages do work. You just have to leave the mission in order to claim the rewards. The cage needs to be in the correct position as well - close enough to the habitat of the animal you want to catch. The balloon rescue option is only suitable for large animals like bears. Just like enemy soldiers, players have to first tranquilize the animal before the Fulton option becomes available in the context menu. For small animals you can also go for the tranquilizer option and then manually pick up the animal using the action button. This is an alternative to the Capture Cage option so long as you're willing to chase an animal and shoot it with a tranq dart - which can be tricky in the case of small animals such as frogs. Note: shooting an animal with a lethal weapon will kill it and capture is impossible. Every animal you capture will reward you with a certain amount of GMP which varies depending on the rarity of the animal. Common animals are worth about 1000 where as rare animals can reward you with 50,000.. There's also another point to capturing animals though and that's your Heroism score, which is more important in the game than you might realize. I won't spoil this anymore than saying that. Besides these rewards, capturing animals helps to fill up your zoo (Animal Conservation Platform) which makes for a great experience back at Mother Base. See below for more details about the zoo. Although you can capture animals at any stage in the game, it isn't until a certain trigger that the zoo, known as the Animal Conservation Platform, is actually built for you. There is no money involved in this expansion to Mother Base and you can't force it to be built by capturing a certain number of animals. 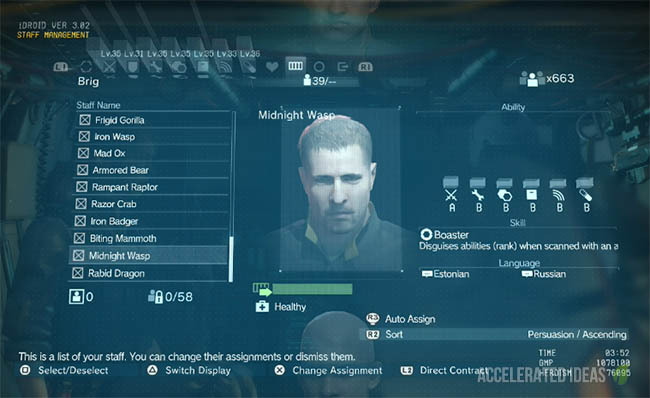 Requirements: Simply complete Mission 25 and the Animal Conservation Platform is automatically built for you back at Mother Base. 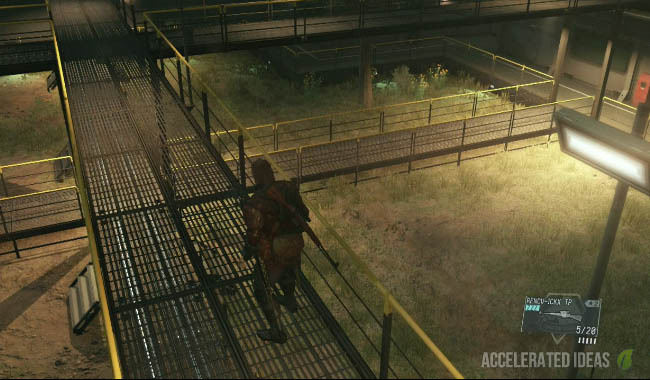 Visiting the zoo is possible in the same manner as you would explore other Mother Base platforms. The big difference is that the platform is located away from the Command Centre and this has the benefit of removing the long travel time. Players can press the appropriate button on the iDroid (while choosing a Mother Base landing zone) to switch to the zoo platform and choose a helipad there. The zoo looks really cool in the game, resembling something out of the Jurassic park films. I strongly recommend you pay a visit once in a while. There's mesh preventing the animals escaping but you can still drop down into a cage if you're brave enough!